This time of year, Bangkok is flooded with tourists from all around the globe. We see Indians in saris and Saudis in dishdasha, Germans in Alpine hiking gear, and Australians in inappropriately skimpy shorts. (Well, not just Australians!) Watching the kaleidoscope of humanity and fashions pass by can make for an entertaining afternoon. A few days ago, however, I had an “oh, my goodness” moment as I changed platforms at Siam Station. A pair of Japanese men were descending the escalator behind me and out of the corner of my eye I thought one of the men was wearing pajama bottoms. It turns out they were just very colorful drawstring pants. While Tawn mentioned that drawstring pants are in fashion, I’m hard-pressed to think that this might be the combination that fashion prognosticators had in mind. Regardless of what they thought, he’s certainly more modestly dressed than some of our guests are, and so long as he’s comfortable, that’s the important thing. This entry was posted in Uncategorized and tagged Bangkok, Fashion, Thailand, Tourist by christao408. Bookmark the permalink. Not exactly my style, but if he’s brave enough to go out in public like that then more power to him! At least he wasn’t wearing the same thing in capri pants. LOL @ the pants, but I wonder how you managed to capture this picture without him noticing! OK the pants are fine and the shirt is acceptable – just not together! Plaid and stripes oh my! Hope he was happy (obviously his fashion sense is on vacation too – just not in the same hemisphere)! hahahaha.. I think you are right, Chris, they are pajamas. 🙂 Happy New Year! Those pants must be burned!!! Throw in the sandals too!!! AH! The horror, the horror. I fear I dress for comfort and not fashion when I am not working. However not in those pants!! 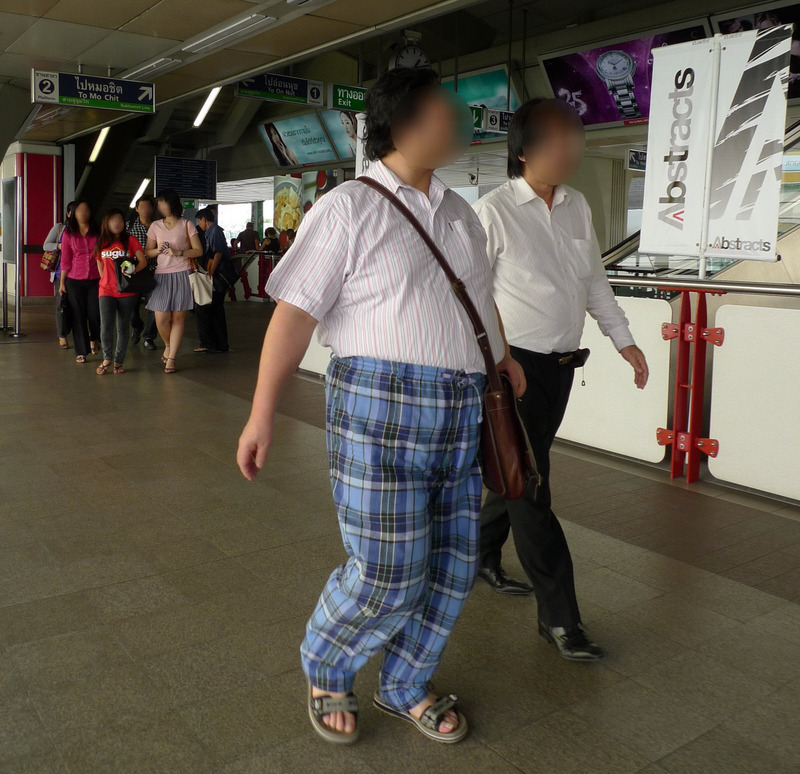 Hmmm, that kind of oufit from shirt to pants and sandals..seems more typical of a Chinese than Japanese, no? Maybe the pants could have been saved if he had worn a different shirt, and not tucked it in. @LADYLILYTHAO – That would have helped, wouldn’t it? @icepearlz – Good question. I’m not sure if that is typical or not, but they were definitely speaking Japanese…@Fatcat723 – I’m all for dressing for comfort. It just seems that a SOME level… =D@kenpcho – Yeah, I knew you’d appreciate this combination. @YNOTswim – If he had a matching top, I’d be certain they were PJs. @AzureRecollections – They sure are an odd couple. @murisopsis – He looked to be having a fine time, which is the most important thing. @Southeast_Beauty – I had to hold the camera down in front of me, shooting up. Of eight shots, this was the only one that came out. I always keep the sounds turned off on my camera so you don’t hear a shutter click. @ElusiveWords – Oooh… bare ankles! @Roadlesstaken – Fortune favors the brave, as they say. I’m not sure if this counts are being brave, though. Maybe just fool-hardy? @brooklyn2028 – Ultimately, the whole matter of what people wear is irrelevant. Beauty is, after all, more than skin deep. But I do get a laugh out of some of the outfits people put on. @onmovement – But you really, really want to find a word for them, don’t you? Wait, those totally look like pajama bottoms!